Whether you're coming to San Antonio for a weekend visit this Fall -- or you’re a local looking for a weekend staycation destination on the Riverwalk -- you should definitely consider a stay at the San Antonio Marriott Rivercenter! 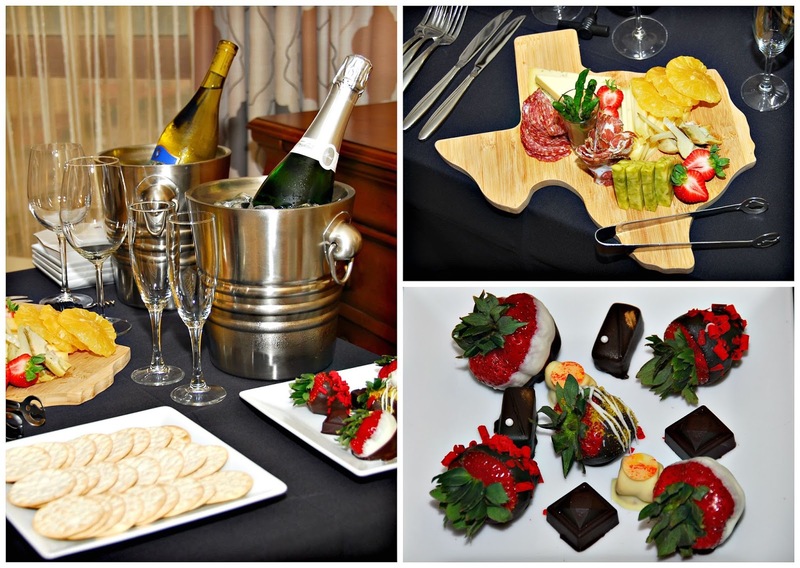 This large, modern hotel is convenient to both the famous San Antonio Riverwalk and Rivercenter Mall, as well as numerous Downtown dining destinations. 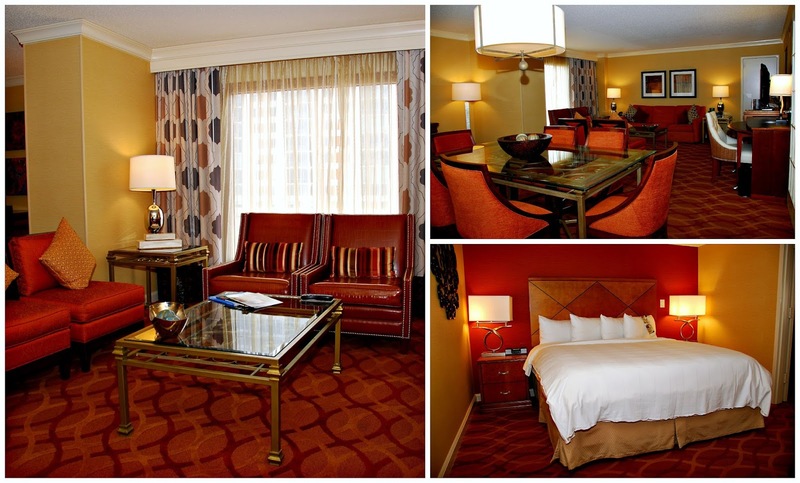 Michael and I recently enjoyed a fabulous overnight stay in a gorgeous suite that included a fantastic Sunday brunch. 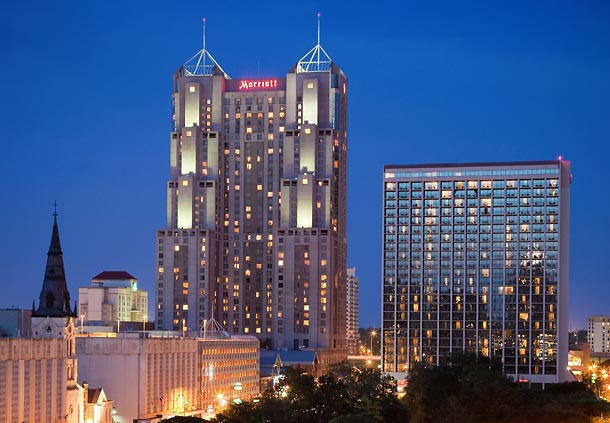 The San Antonio Marriott Rivercenter is a perfect home base for enjoying all that the Downtown area has to offer. We arrived and were quickly checked in by the friendly front desk staff. Then we made our way to our large suite, which was decorated in soothing earth tones. The suite featured a large living and dining area, and a spacious bedroom and adjoining bathroom. After settling in, we stopped at the lobby bar for a late lunch. 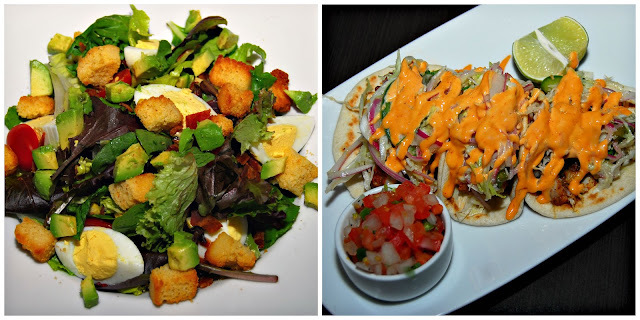 I selected the Cornbread Salad, and Michael had Fish Tacos. 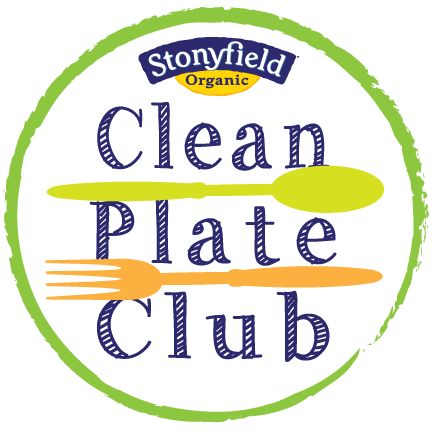 The food was perfectly prepared, reasonably priced, and delicious – the perfect start to our visit! My salad was perfect for a Summer day: cornbread croutons, avocado, bacon, boiled eggs, grape tomatoes, and ranch dressing. After our lunch, we walked to the back of the hotel lobby and noticed that it connected directly to Rivercenter Mall. This is very convenient for shopping, grabbing a quick bite, or even catching a movie or IMAX. We walked through the mall for a bit, then we headed back to our suite to rest up and get ready for our dinner at Texas de Brazil Steakhouse. If the weather outside is nice, the quick 15-minute walk to Texas de Brazil from the San Antonio Marriott Rivercenter is very pleasant. Texas de Brazil is a Brazilian-style steakhouse that features a wide range of perfectly roasted meats, as well as a huge 60-item salad bar area. We arrived and were warmly greeted by the manager, who seated us and had us select cocktails while we discussed the menu. If you’ve never dined at a Brazilian steakhouse, the concept is pretty simple: pay one price for as much roasted meat as you care to enjoy! 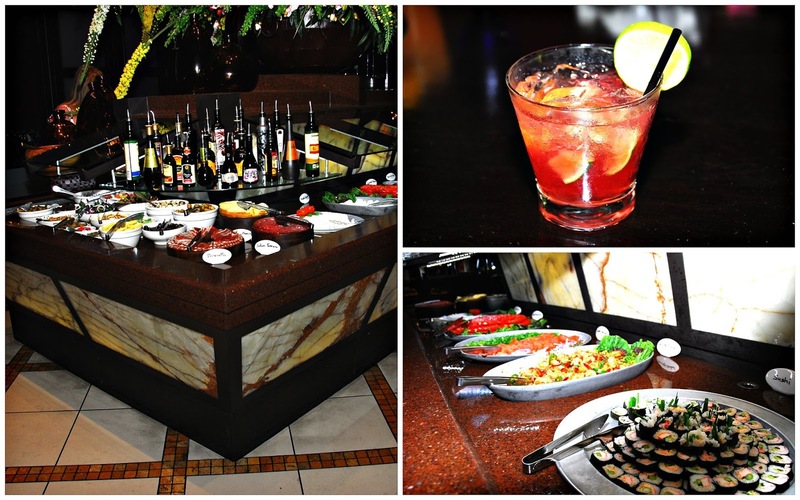 Before we enjoyed Texas de Brazil's wide range of roasted meats, we visited their expansive salad bar. 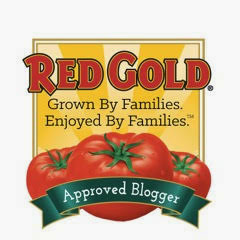 It features something for everyone: hot and cold appetizers, vegetables, soups, and salads. After enjoying our salad bar selections, we turned our attention to the 16 different seasoned, roasted meats being offered. 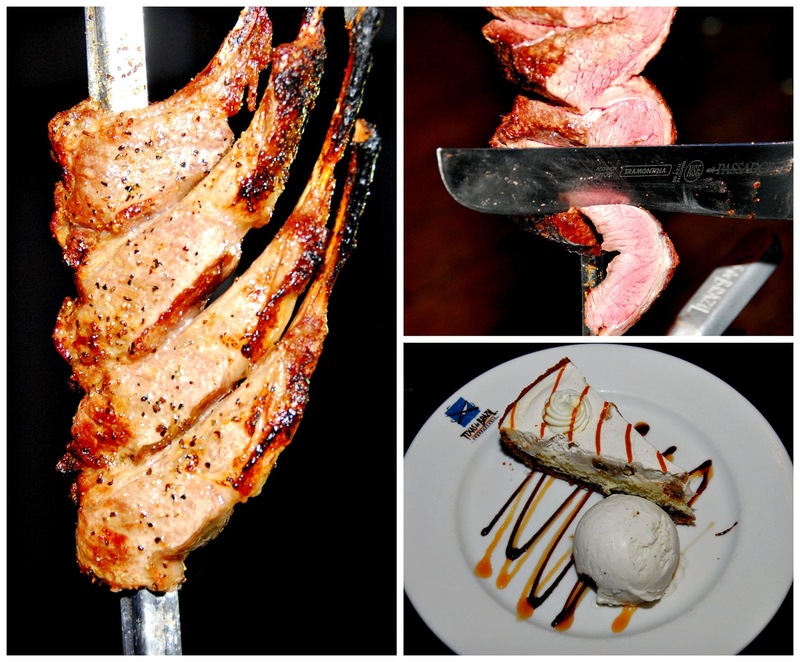 Each one is carved directly onto your plate from a large skewer by friendly gaucho servers who roam the dining room. All of the meat was perfectly cooked, well seasoned, and juicy -- but our two favorites were the lamb chops and the Brazilian picanha beef. Because you pay one price for as much food as you care to enjoy, it's easy to sit back and enjoy the parade of meats! We were pretty full after enjoying trips to the salad bar and multiple rounds of roasted meat, so we opted to share a dessert: Bananas Foster Pie served a la mode. For locals, Texas de Brazil is ideally located if you’re attending a show at The Majestic Theater. 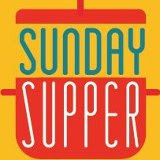 Simply park your car with the valet, enjoy your meal, then walk across the street to The Majestic for your show. 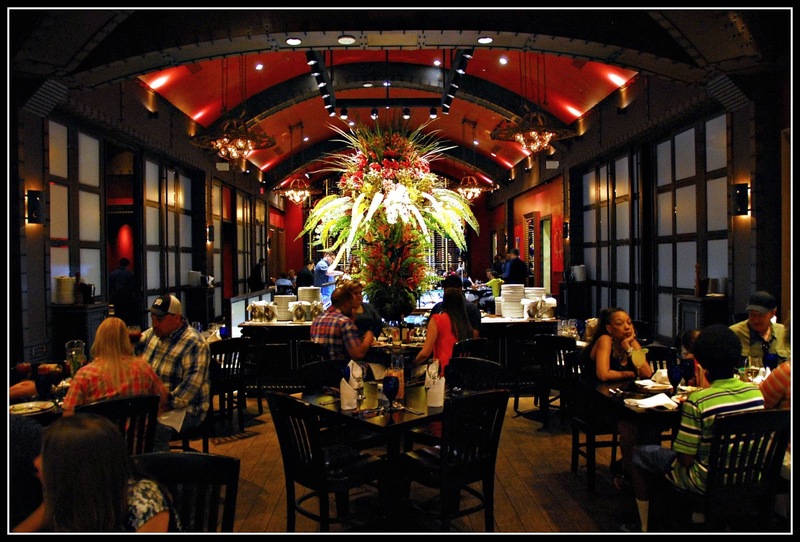 Texas de Brazil offers excellent food and service in a gorgeous setting. After dinner, we walked back to the Marriott…where we discovered a fabulous display of wine, cheeses, hand-made chocolate, and other goodies waiting in the dining area of our suite. We sampled some champagne and a few of the treats before falling asleep in our comfy King-size bed. The next morning, we slept in a bit. Before we knew it, it was time to head downstairs for brunch at Sazo's restaurant. We enjoyed several perfectly prepared items served by the friendly waitstaff. 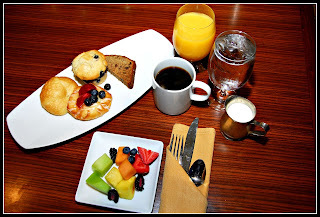 We started with a selection of baked goodies, orange juice, and fresh fruit. 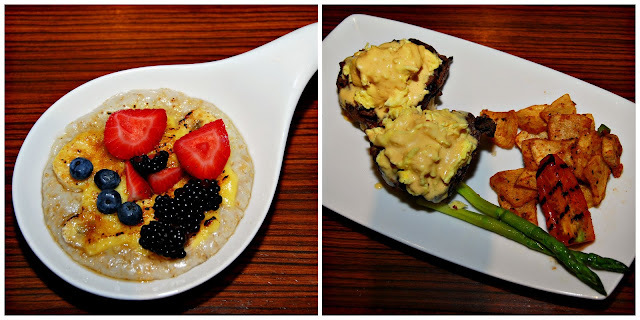 Next out of the kitchen was elegant Oatmeal Cream Brule – hearty oatmeal topped with a creamy topping, a cracked sugar shell, and berries. It was delicious and just a little decadent. Our entrée was Southwest Benedict with Tenderloin and Chipotle Hollandaise. This spicy take on a brunch classic featured a biscuit base, grilled tenderloin, and scrambled eggs drizzled with spicy hollandaise. We were very impressed with all of the brunch menu items that the chef hand-selected for us. After this lovely brunch, it was time to head back to our lovely suite to pack our overnight bags and head back home. We thoroughly enjoyed our stay at the San Antonio Marriott Rivercenter! The hotel is perfectly located to enjoy all that the Riverwalk area has to offer, and the rooms are spacious and nicely decorated. Disclosure: The San Antonio Marriott Rivercenter provided us with a complimentary overnight stay and brunch to facilitate this post. 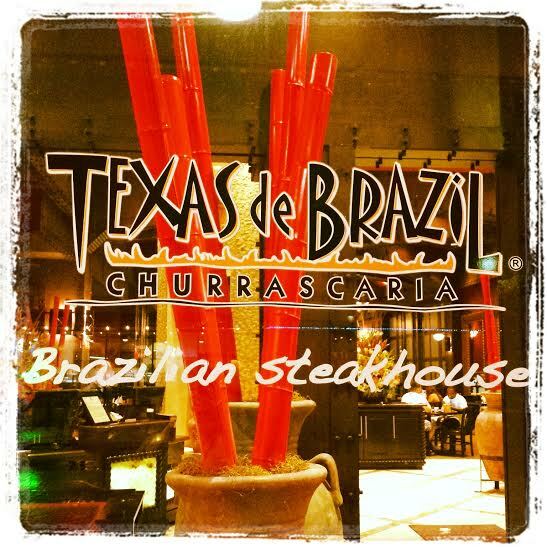 Texas de Brazil also provided us with a hosted dinner to facilitate inclusion. Unless otherwise noted, photographs are copyrighted by Michael K. Garcia and may not be copied or used without prior permission.